Eora Creek was the scene of a major battle in the counter-offensive. On October 1942 Brigadier J.E.Lloyd’s 16th Brigade took over the advance from the 25th Brigade at Templeton’s Crossing and by the afternoon of 21 October was approaching Eora Creek. They struck an isolated Japanese position, but next morning found that the Japanese had withdrawn. 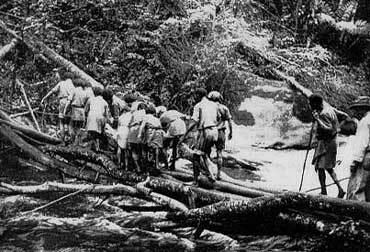 However, as they entered the village they were hit by enemy machine-gun fire and mortars. It was clear that the main enemy position was on the high ground beyond the two bridges. Crossings were made during the night or 22 October and next morning the 2/1st Battalion under Lieutenant Colonel Paul Cullen advanced into the teeth of the enemy position taking many casualties; by the end of the day the forward companies were face to face with the enemies’ main positions but could go no further. 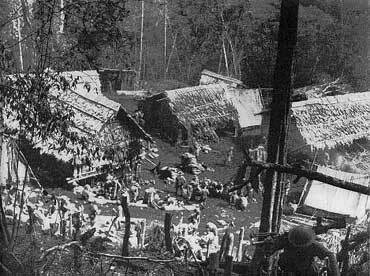 Meanwhile, the Japanese caused much damage with mortar, artillery and machine-gun fire at the rear Australian positions. On 24 October two companies of the 2/3rd Battalion moved forward to support the 2/1st Battalion but they made little progress. It was not until the morning of 27 October that the 2/3rd Battalion was able to begin a major attack from the left flank. This continued throughout the next day until at last Japanese resistance broke. The Australians had fought with great courage but the cost had been high. According to the 16th Brigade war diary, the Brigade lost 72 killed and 154 wounded although the battalion war diaries put the figure much higher. It had been a hard fought battle in very difficult terrain, thick scrub and constant chilling rain. With insufficient supplies (because of lack of carriers), the divisional commander, Major General A.S.Allen, was not able to deploy his whole force at one time. The Allied commander, General Douglas MacArthur, who had never seen the terrain, demanded a quick victory, and as a result of the delay at Eora Creek on 27 October, Major-General Allen was informed that he was to be relieved of his command. Major-General George Vasey arrived on 28 October to take command, but by then the battle was over.